Ribbon may vary. Roses may be small or large head.. Size: Approx. 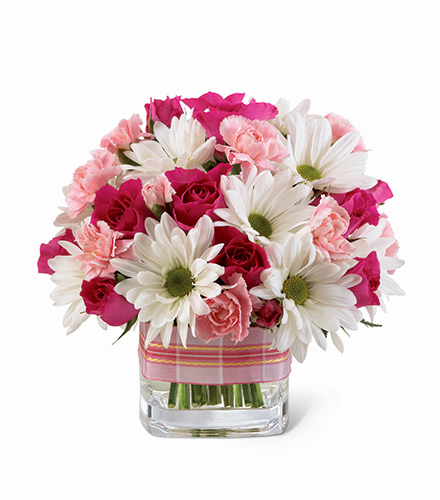 9" x 9"
Send a Sweet Surprise in the form of pink and white flowers. Hot pink spray roses, pink mini carnations and white daisy pompons are sweetly arranged in a clear vase and trimmed with pink ribbon.. Popular Flower Arrangements - Sweet Surprise in Glass Cube. Florist Notes: More money allows more stems to be used in your gift. Balloons, Bears, Chocolates and Full Sized Greeting Cards can be added to this gift when you checkout.